Today marks the 66th birthday of the United States Air Force. Though the youngest branch of the military, the history and heritage of the Air Force is even older than its official creation on September 18th, 1947. From the testing of early aircraft at the dawn of the twentieth century, to the massive expansion in the role of airpower in World War II, to the brave men and women who serve today in Afghanistan, the Air Force has a long tradition of bravery, innovation, and excellence. Join me in wishing the United States Air Force, and all those that have served within its ranks, a happy birthday! 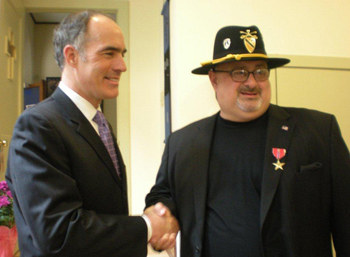 On Monday, May 24, I had the distinct honor of awarding a Bronze Star Medal with “V” Device to Mr. Frank T. Calabrese, a Vietnam veteran. Mr. Calabrese was awarded the Bronze Star for his valorous action in October, 1970 while serving as a Specialist Fourth Class with Company A, 1st Battalion of the 7th Cavalry. As a Medic in support of combat operations in Vietnam, Mr. Calabrese distinguished himself above and beyond the call of duty exposing himself to intense enemy fire to treat three severely wounded Service Members. As a result of his actions, all three Service Members were safely evacuated from the battlefield, ensuring their survival. It was a pleasure and an honor to pin the Bronze Star on Mr. Calabrese with his family and other members of the Lehigh Valley Veterans community in attendance. It is also a reminder to recognize and thank those men and women who have served and continue to serve our country as we observe Memorial Day in the coming week, and pay special tribute to those Americans who have given their lives in military service.